The Children’s Book Bank began when Founder and Executive Director Danielle Swope decided to find a way to give the stacks of books her children had outgrown. Inspired by her own experiences as a Teach for America teacher and a parent, Dani wanted to ensure that her children’s books got into the hands of kids who might not otherwise have books of their own at home. She contacted a local Head Start program that was happy to receive her family’s books and took her kids on a field trip to deliver them. Within a week her phone was ringing off the hook with people looking for the “Book Lady” and asking to sign up for her “program.” Clearly, the community had a need for books! After a few pilot book drives, it became clear that the community ALSO had a supply of books to give. The missing piece was a sustainable system to get the books off shelves and into the hands and homes of kids in need. 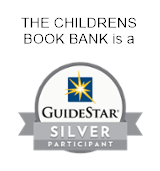 The Children’s Book Bank was created to fill that void by engaging the community in collecting, sorting, and distributing donated children’s books. Since becoming a 501(c)(3) nonprofit in 2008, The Children’s Book Bank has organized over 10,000 community volunteers to channel over 650,000 books into the hands and homes of over 50,000 children in need in the Portland area.